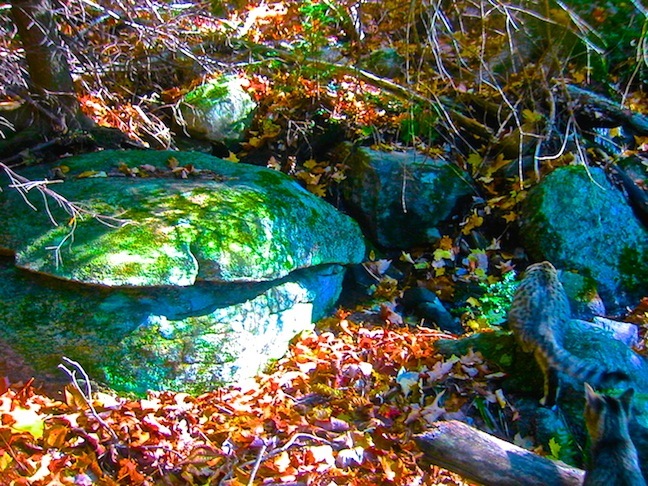 Here on my hill in Monson, Massachusetts there are hundreds of large and small stones that appear carved, and a number of lintels that suggest a cave system. . .
'milky way' stone [& Bruno]. . .
beehive stone [& Elsa]. . .
large partially unearthed stone. . .
lintel, before excavation. . .
lintel, in the process of excavation. . .
etched stone, beginning to be unearthed. . .
similarly etched stone at America's Stonehenge. 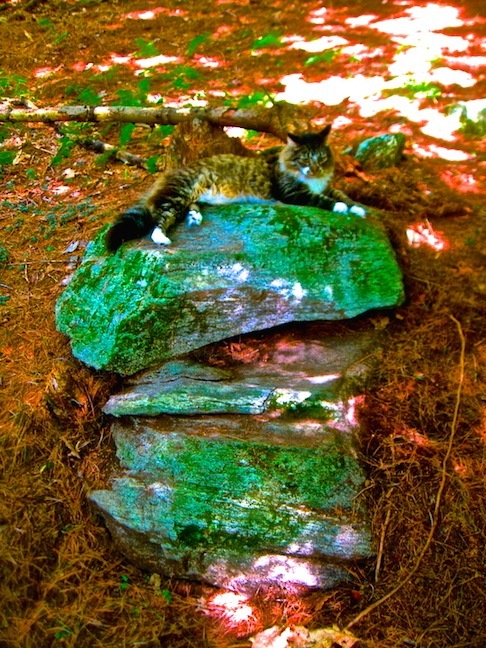 . .
another view of the etched stone, with other tumbled stones [& Pippi]. . .
carved stone near the etched stone. . .
double-tiered lintel [3 angles]. . .
layered stone, partially unearthed. . .
More large stones. 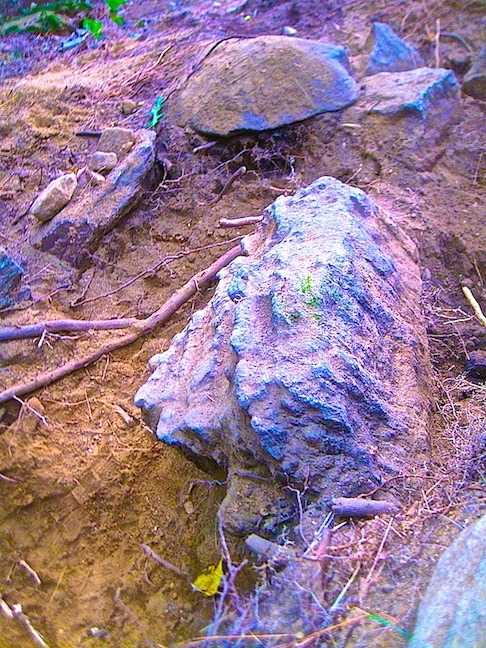 . .
19..two recently unearthed stones, both about 5ft wide..
Two sides of an interesting stone. . .
Sumerian cuneiform? 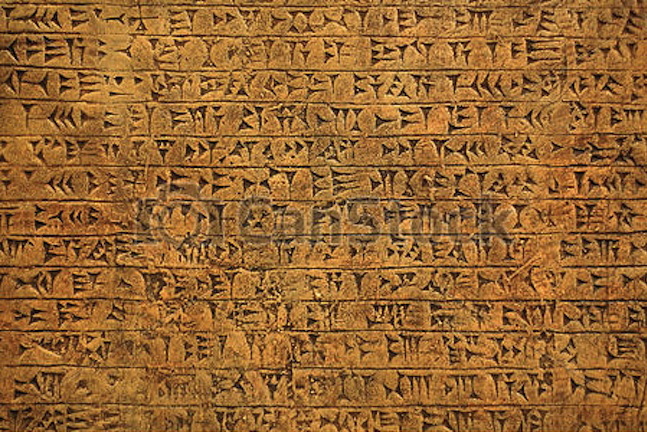 'Cuneiform' means 'wedge-shaped', from the Latin word cuneus [wedge].". 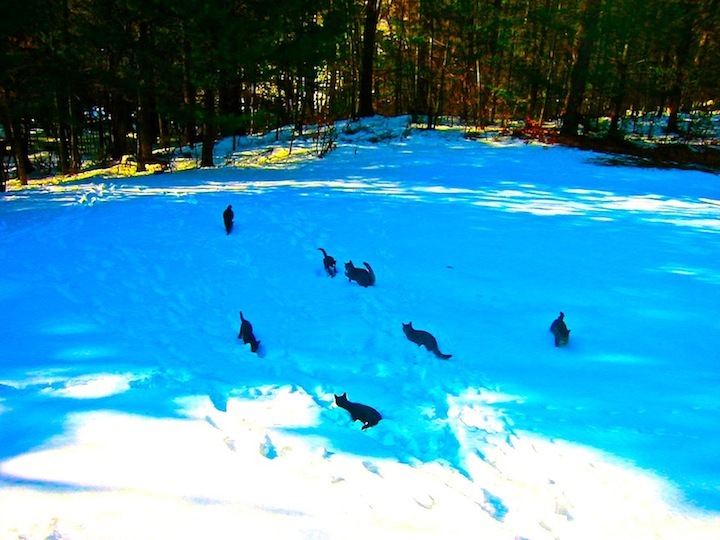 . .
the kitties love Faerie Hill. . .
heading towards the hill. 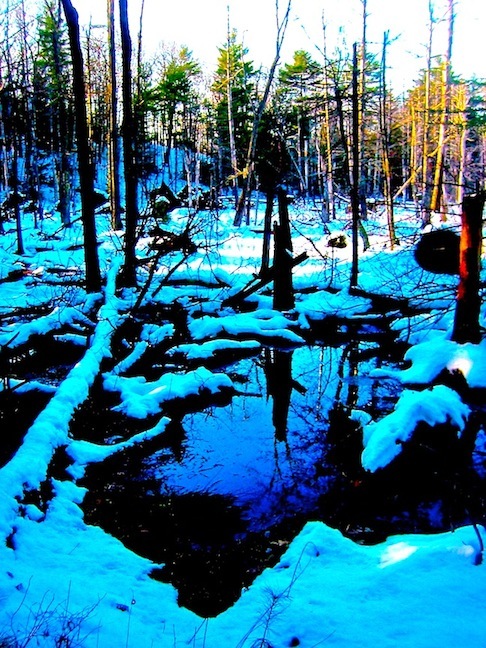 . .
beaver pond in winter. 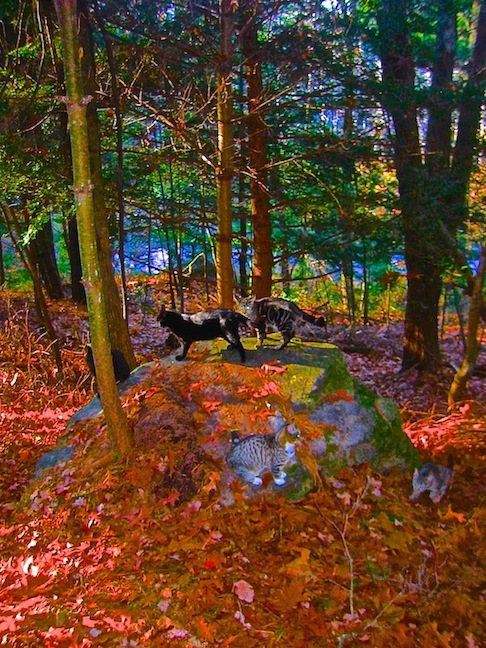 . .
Orbs and faeries may appear when you use a digital flash, which happens often on Faerie Hill. Though you can't see them when you take the shot, you can see them in the viewfinder after you take the shot. When that happens I quickly take another shot of the same location to confirm the sighting. 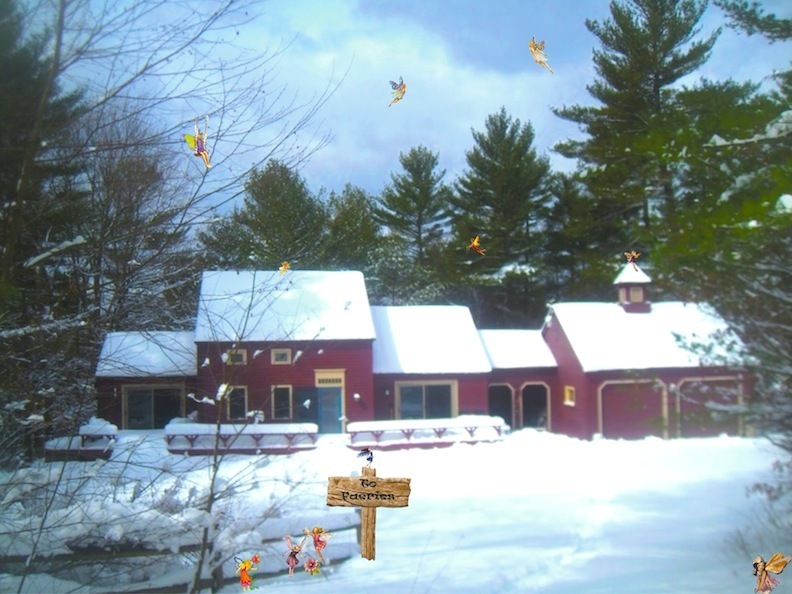 Faeries are in flight and on the move, so they won't appear in the same location twice. 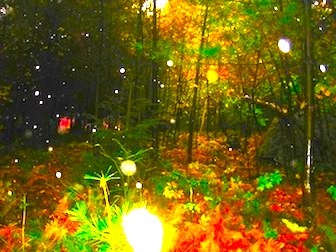 Here are the confirmed sightings of faeries so far this summer. 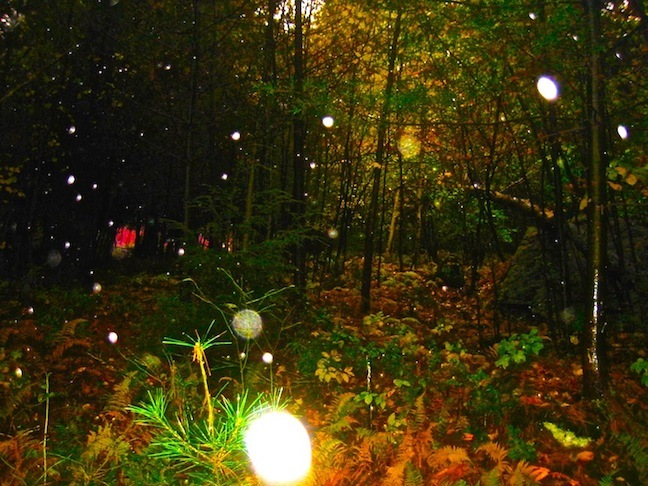 . .
A few orbs surrounded this spectacular faerie. . . 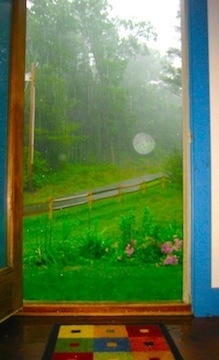 The orbs were out in force that night. . . The same faerie in two different shots and in others, too. 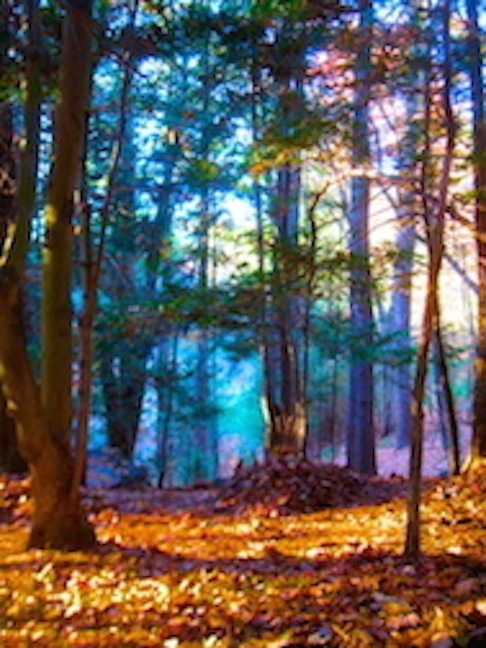 . .
A second faerie in the same shot as above, in the distance to the left. . . So bright I have to wear shades. 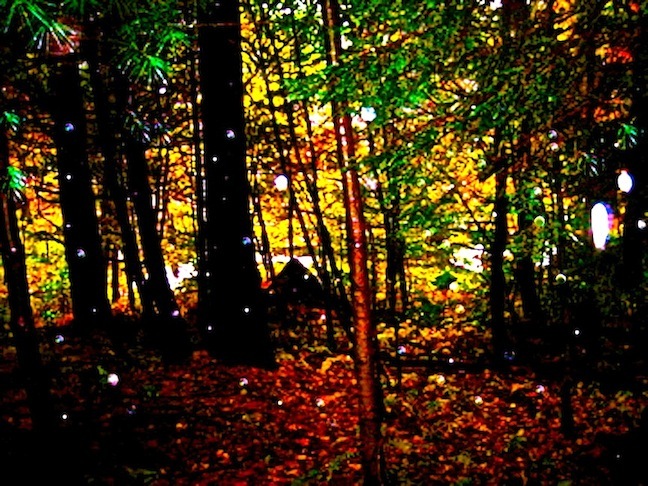 . .
Orb or faerie? . . .
Flew right past my face.. is it a bat? Looks like a flying stingray. . . Partial faerie shot. . .
Another shot with two faeries. . . 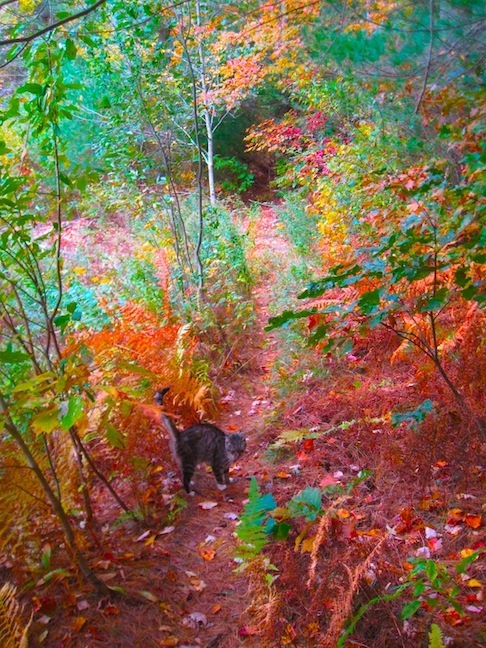 In an area I'm presently clearing the faerie is in the distance, upper left of center, but unmistakable and beautiful . . . 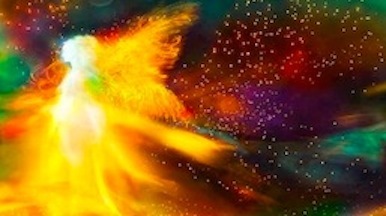 This faerie is below and to the right of the sun and reflects its rays. . . This faerie is near the bottom of the tree. . . This faerie has a reflection, at the bottom, to the left. . . 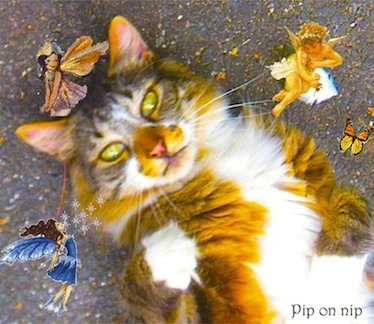 The faerie near Pippi's nose has made other appearances but this is the first time inside and without a flash. . . 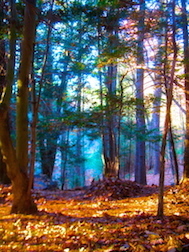 This one blew my mind. . .it was morning so I turned off the automatic flash, and wasn't expecting any faerie shots. Then my camera suddenly shut itself off, very strange. 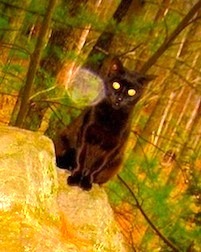 So naturally I wondered if the faeries wanted me to keep the flash on so I could take their pictures. So I did and this is the NEXT picture I took. . . 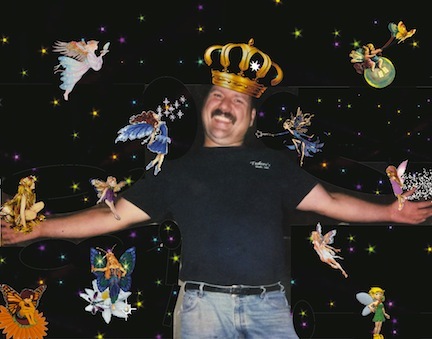 If you're thinking 'faeries don't have that kind of power', I've seen otherwise. More on that later. All the faeries together. 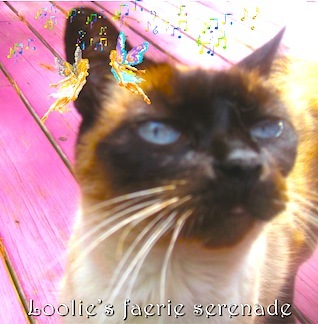 . .
Faeries are an enigma whose true nature and form we may never know, but thanks to digital cameras we can share what they show us. Well have I kept the same! But this is a different game. 'Tis the Dreamer whose dream come true! Is anything better, is anything better? tell us it then. Thousands of years, thousands of years if all were told." 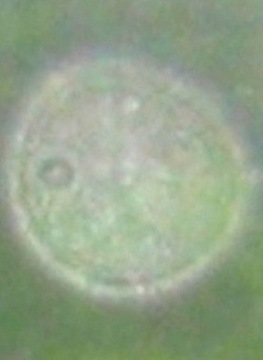 The same orb, one enlarged. . . I took this shot outside my front door. 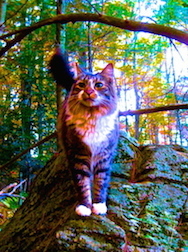 I'd lost a beloved kitty two weeks before and I believe she came back for a comforting visit. Have you ever seen an orb with a kitty face before? 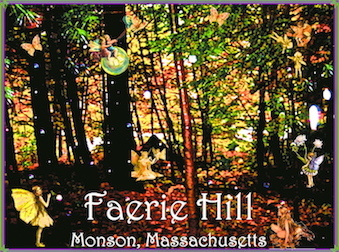 . .
Eric Morin of Monson is my Faerie Godfather, expertly bringing out the beauty of Faerie Hill. . . Though most people are familiar with the Highlander movies, few know it's based on the legend of the MacLeod Faerie Flag. 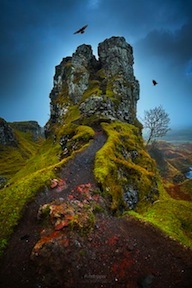 As the story goes, a MacLeod prince married a beautiful faerie princess and they soon had a son, but the princess had to return to her people without her husband and child. 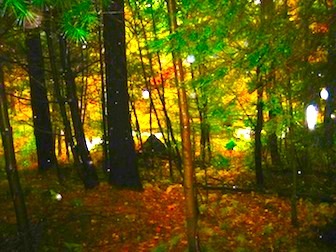 One night she heard her son crying and she couldn't bear it, so she returned to cover him with a silken blanket, which became known as the Faerie Flag. This enchanted fabric is said to grant three wishes, and one still remains. 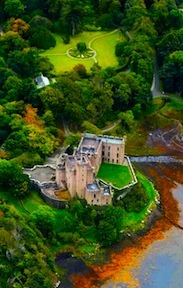 The Faerie Flag still hangs in Dunvegan Castle on the Isle of Skye. Wales Road in Monson. . .Down the road from Faerie Hill..
8000 acres of forests, meadows and wildlands. 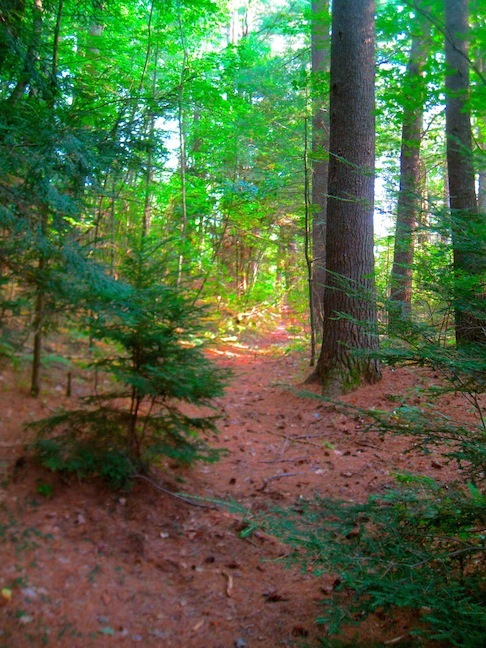 . .
4.7 miles of hiking/mountain biking/horseback riding trails. . . This stone wall with a large white quartz block jutting out is 1/2 mile down the road from Faerie Hill. 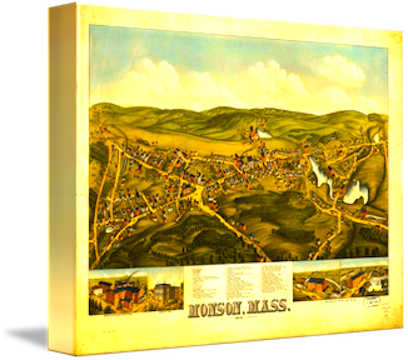 . .
More on Monson, Mass. . .
"Monson consists of a north/south oriented Y-shaped valley nestled between two prominent ridge lines. The western ridge and hills are granite intrusions that separate Monson from Wilbraham. 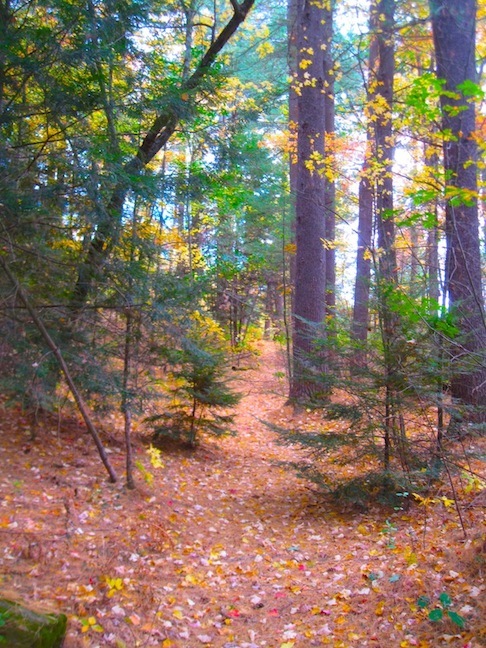 Monson's highest peaks, such as Peaked Mountain (1,278 feet), West Hill (900 feet), and Chicopee Mountain (800 feet) are found along the western ridgeline. 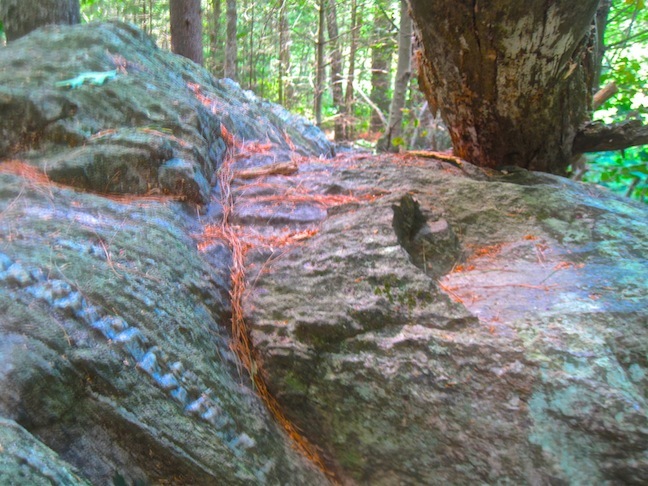 At the base of these formations, Monson Granite was quarried for use in many of the Town's now historic buildings. The east ridgeline [is] composed of granite, sandstone, feldspar, and quartz. 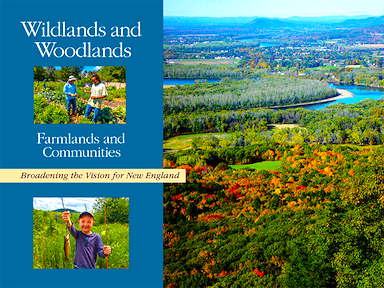 Monson's valley [also] contains drumlins and eskers." A Monson pyramid? . .
Drone shot of Wales Road, with the Monson pyramid in the distance. 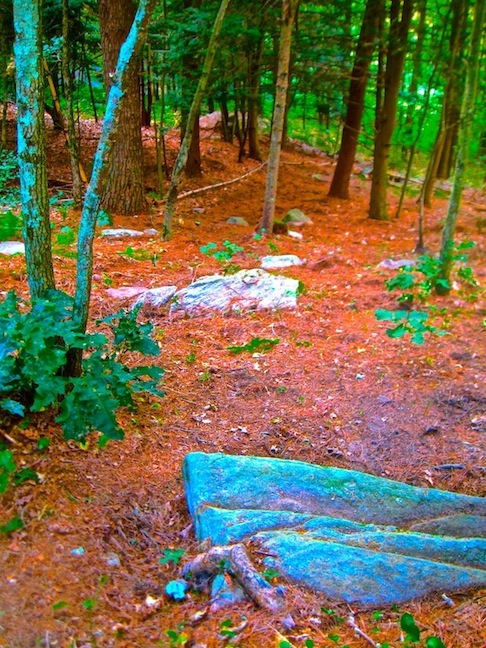 . .
"Peaked Mountain is a hidden gem. . .in the hills of Monson, MA. The summit is 1,227 ft. and takes about 45 minutes to hike one way. Once you hit the top you'll be greeted by a small mailbox, where several notebooks are usually kept and hikers can leave a message, almost mimicking the sign-in stops on the Appalachian Trail. 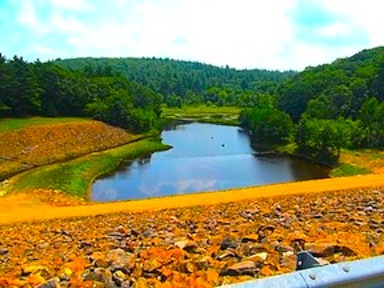 At the top looking out you can gaze northward across the Quabbin Reservoir watershed and even get a glimpse of New Hampshire's Mount Monadknock." 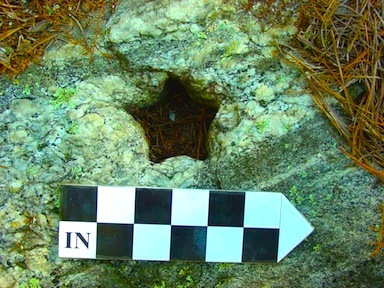 Mysterious star-hole at Monson's Flynt Granite Quarry. . .
"Many cities across the world are built on seven hills. These include two major power centers - Rome & Washington DC. Maybe the comet cataclysm 12,000 years ago that formed the Carolina Bays also buried the pyramid complexes that seem strangely absent in North America, despite being plentiful in South & Central America. 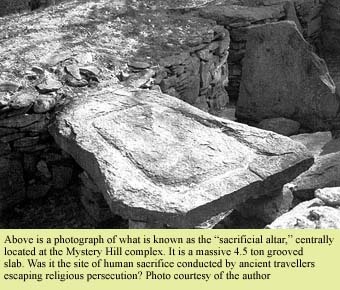 Maybe those still visible are believed to be hills, because "There are no pyramids in North America". That's certainly true of the Bosnian Pyramid complex, overlooked for centuries because "There are no pyramids in Europe." It seems Semir Osmanagich didn't so much discover the Bosnian Pyramids as notice them with unprejudiced eyes. 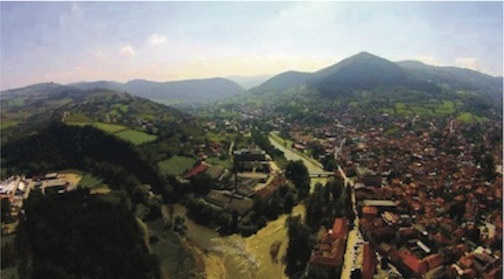 "[S]even hills were molded on the surface potentially representing the map of the terrain where the Bosnian Pyramids are located." "[I]n the Hindu system, the place of the Siddhas, called the possessors of knowledge and the magnificent perfected, is immediately beneath the moon. The mount of seven seps and the seven starts was also represented by seven hills and seven pyramids. The Ancient Great Mother is described in Revelation as sitting on the Seven Hills. 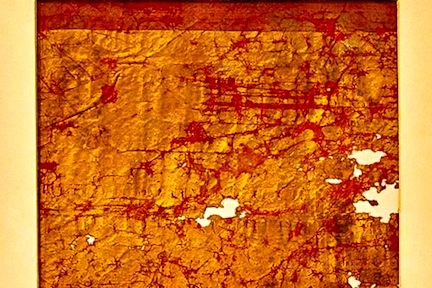 These are found in various localities, in Mexico, Britain, China and Inner Africa, as well as at Rome. Whenever identified they represent the seven hills of heaven, the seven forms of the celestial mount corresponding to the seven branches of the typical tree…and seven mountains or hills on earth stand for seven constellations in heaven." from The Natural Genesis: Or, Second Part of A Book of the Beginnings, 1883. THE CAROLINA BAYS & THE GREAT FLOOD OF 10,000 B.C. 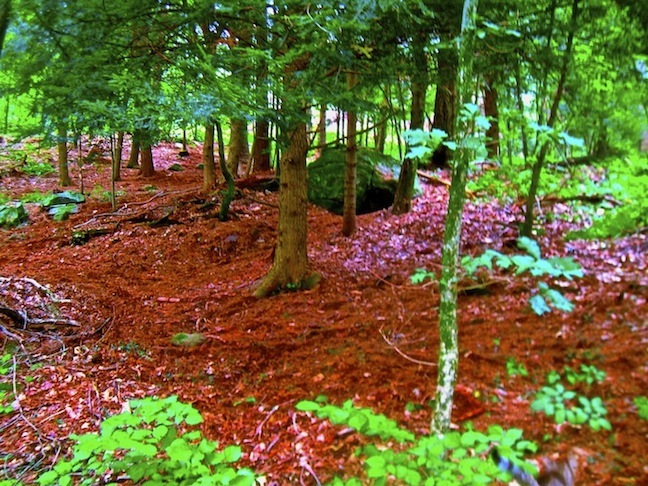 The Carolina Bays are over 500,000 oval shaped bays from Maine to North Carolina, all oriented in a northwesterly direction and all dated to about 12,000 years ago. Evidence indicates that the bays were created by the impact and debris of a comet dating back 12,000 years, to the time of the 'great flood' written about in cultures worldwide. Dr. Barry Fell of Harvard University spent many years investigating stone evidence of an ancient Celtic and Phoenician presence in North America, particularly New England. His three immensely popular books enraged mainstream archaeologists, and following Dr. Fell's death in 1997 they went on the attack - dishonest cowards whose agenda to hide our true history harms us all. ATLANTIS FOUND! 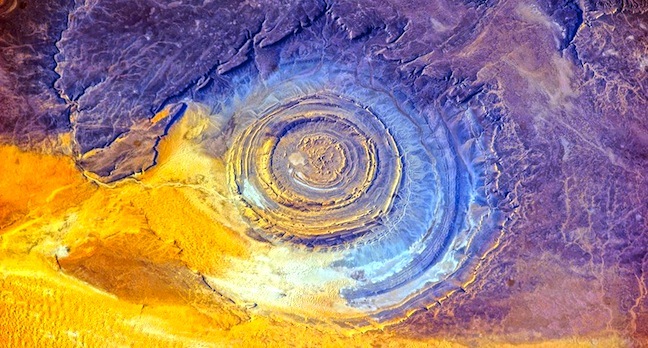 The 'Eye of the Sahara', the Richat Structure. . . Enormous Machine-Cut Stones At PumaPunku? 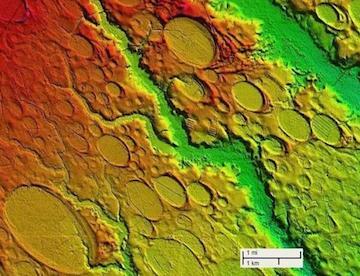 Ancient "Engineering Marvel" Found In Ohio? OTHER LINKS OF INTEREST. . .
Julia Ryder on Montana Megaliths, etc. Ivar Nielsen Papers - Stunning! Faerie Hill Airbnb coming soon. . .